Whitworth has won a prestigious Silver Award in the Council for Advancement and Support of Education (CASE) 2011 Circle of Excellence Program for a video, With Grace & Truth: The Robinson Presidency, commissioned to celebrate Whitworth President Emeritus Bill Robinson. Whitworth was one of two Silver Award winners in its award category -- video general features. Eighty entries were submitted for that category, in which other winners included the University of California-Los Angeles, Johns Hopkins University, Massachusetts Institute of Technology, and Loyola Marymount University. For a complete list of winners and additional details, please visit http://www.case.org/. Bill Robinson, who led Whitworth from 1993 to 2010, was the second longest-serving and one of the most influential presidents in the school's nearly 122-year history. When Robinson announced in Sept. 2009 that he would be stepping down at the end of the 2009-10 school year, Grace & Truth was commissioned to celebrate his presidency and to honor his wife, Bonnie, and her significant contributions to campus. The video premiered at a farewell banquet for the Robinsons, held in May 2010 at the Davenport Hotel in downtown Spokane, and was featured at a series of regional farewell events, as well. The video, which was produced by Whitworth in collaboration with Spokane-based North by Northwest Productions, included narratives from faculty, staff, students, alumni, trustees and community leaders. It also showcased the ways in which Robinson articulated Whitworth's mission-driven identity, oversaw significant improvements to the campus, piloted increased enrollment and a more robust endowment, and heightened the university's reputation in higher education. In addition, the video showed how Robinson's leadership positioned Whitworth for continued, and even increased, success under new president Beck Taylor. "We were committed to making a film that would capture the essence of Bill and Bonnie's significant service to the university, as well as our excitement for what the future holds as a result of Bill's leadership," says Tad Wisenor, Whitworth's director of campaign planning, who served as an executive producer on the project. "We believe we were successful in that endeavor, so it's gratifying to know that our peers in higher education feel the same way." 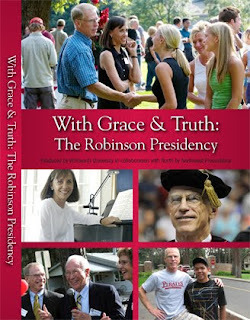 To view With Grace & Truth: The Robinson Presidency, please visit http://www.whitworth.edu/Administration/InstitutionalAdvancement/PresidentEmeritus/WithGraceAndTruthVideo.htm. The Circle of Excellence Awards Program recognizes outstanding work in communications, marketing, alumni relations, advancement services and fund-raising as judged by peer professionals at schools, college and universities as well as by professionals from outside education. Winners are selected based on a number of factors, including overall quality, innovation, use of resources and impact on the institution and/or its external and internal communities.